In 1988 I was 12 years old. I was a 6th grader at the Susquehanna Township Middle School. I lived in the suburbs. I had never kissed a boy. I wore giant Sally Jesse Raphael-style glasses and every day was a bad hair day. In other words, I was a pretty typical 12-year-old kid. Therefore, despite our gender differences, I felt a strong kinship with Kevin Arnold (Fred Savage), the protagonist of The Wonder Years. Kevin was also a typical 12-year-old kid: he was alternately moral and selfish, brave and cowardly, kind and cruel. He knew better than to question his parents and teachers, but he did it anyway, and suffered the consequences. He had an older brother who tortured him and a father who worked a lot and said very little. He was grappling with an adult world he only partially understood, but felt its ramifications as strongly as any adult. Kevin was me, only in a boy’s body. NORMA: One of the boys on our block was killed in Vietnam several weeks ago. LOUIS: Oh, I know. I mean, uh, Karen told me. Another meaningless death. JACK: I beg you pardon? LOUIS: I just meant that…it’s just a shame, uh…a kid has to die for basically no reason. JACK: I don’t think it’s meaningless when a young man dies for freedom and for his country. LOUIS: I just have a little trouble…justifying dying for a government that systematically represses its citizens. NORMA: Oh, honey. Try the potatoes – I put grated cheese on them. JACK: What the hell is that supposed to mean? JACK : Look, buster! I happen to believe that freedom and democracy have certain advantages that Communist dictatorships don’t, and that is what Vietnam is all about! LOUIS : No, man, that’s what they brainwash you to believe it’s all about. JACK: So…you think I’ve been brainwashed, do you, Louis? LOUIS: No. No. Look… I think anyone…who supports the American war effort in Vietnam…[shrugs]…is having the wool pulled over his eyes. LOUIS : Just like they did with Korea. JACK: [getting angry] What the hell do you know about Korea? I was in Korea. I lost a lot of good friends there. KAREN: Daddy, that doesn’t have anything to do with what we’re saying. JACK : And they weren’t brainwashed! They were brave men who weren’t afraid to fight for what they believed in. Now if you’re afraid to fight – why don’t you just say so?! Why don’t you just admit you’re chicken? LOUIS: You’re damned right! I am chicken. I don’t want to die like your friends! What do you think that you achieved over there? Hmm? Do you think that those people are free? They’re not free, man. LOUIS : You were used, man, and your friends were used. KAREN : Daddy, you never listen to what we say! Some of what we say is true! LOUIS: Don’t accept all this death and then justify it. It is wrong! Your friends should be alive – they should be…[gestures]…enjoying dinner, and arguing with their kids, just like you are. JACK: What do you know about it?! Who the hell are you to say that?! When I watched this scene in 1988, I don’t think I understood the nuances of the argument. I saw it much the same way that Kevin sees it: one more fight in a long string of fights that he has witnessed between his sister and his parents. But recently my husband and I began rewatching this series (it’s streaming on Netflix RIGHT NOW) and I was struck by the honesty of this scene. It would have been easy to make Jack an out-of-touch defender of the old guard holding on to his ideals, even as he sees them crumbling around him. Yet, Jack is sympathetic here and so is his point of view: He fought in Korea. He served his country. Now he is enjoying his reward (or trying to): a comfortable home in the suburbs with his wife and children. When Louis, who could also come off as a radical caricature but doesn’t, begins to poke holes in Jack’s worldview, there is a sadness there. Louis is not enjoying this argument. You can feel that Louis is angry, which we expect, but what I love about this scene is that it also legitimizes Jack’s anger. When he snaps, “What do you know about it?! Who the hell are you to say that? !” you can feel the rage and betrayal of Jack’s generation. 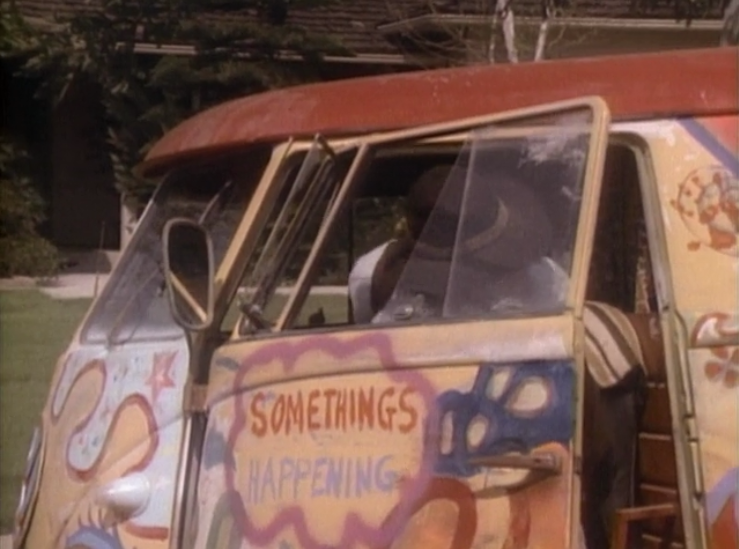 How does this hippie know anything about the way the world works? Where is his authority to speak? And why is his hair so damn long? 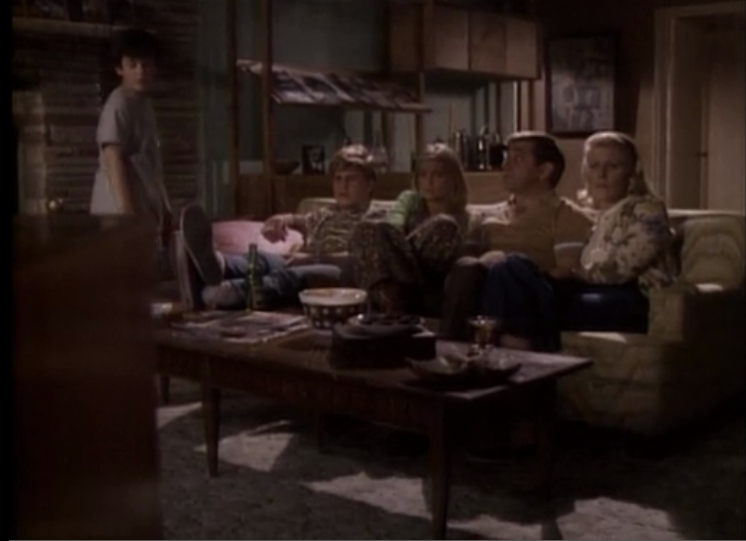 This scene was just one of many that has resonated with me in new ways since I began rewatching The Wonder Years, some 24 years after it first aired. This experience has resulted in a doubled viewing position. On the one hand, I am watching as a 35-year-old and so the historical and cultural touchstones that I missed when I was 12 (the changing meaning of the suburbs in America in the 1960s; the anti-war movement; the students protests of 1968; The Feminine Mystique) are suddenly visible and significant. But at the same time, as I watch, I am still watching as a 12 year old. When I sat down to watch the pilot episode a few days ago, and the opening credits began to play, I felt crushed, not by nostalgia, but by the weight of being 12. Those credits, a faux-scratchy home movie of Kevin Arnold and his family enjoying their last days of innocence, were etched onto my brain so that each frame was a surprise and a memory. This note made me think about my experiences sitting in my father’s beige hospital room with my mother and brother. As we sat there together I realized that it had been almost a decade since the four of us had been alone together; no spouses, no children, no reminders of the lives that we had built apart from the original family unit. Whether we liked it or not, the three of us were transported back to an earlier time in our lives and into roles we had long since abandoned. I was once again a daughter and a sister rather than a wife and mother. I suddenly felt like a child again. These words are a defense of suburban life with its “little boxes made of ticky tacky,” but they are also a defense of television watching itself. Kevin argues that although his generation seems to be living in identical houses and watching indentical shows on their indentical TV sets, that doesn’t mean that their experiences of the world aren’t unique, meaningful, and real. For Kevin, TV doesn’t detract from his reality. It is a meaningful part of his reality. Mine too. 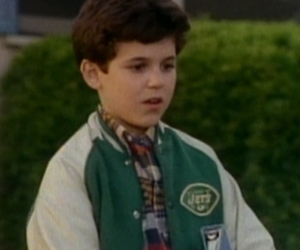 Rewatching The Wonder Years is performing the same spell on me as Proust’s madeleine did on him. 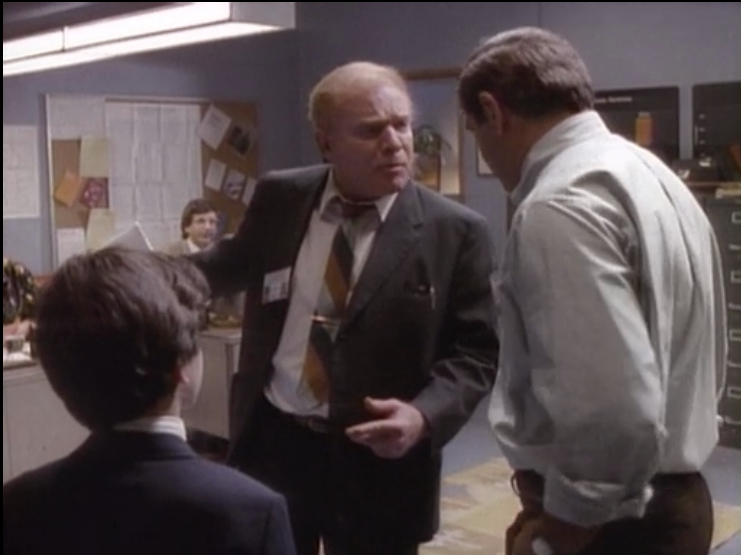 Take for an example, the episode, “My Father’s Office,” in which Kevin attempts to understand why his father is so tired and grumpy when he comes from working his job as a middle-management drone in an ominous sounding place called NORCOM. After asking his father a few questions and receiving only unsatisfactory answers, Kevin agrees to go to work with him for the day. He sees that his dad has a lot of power, which makes him proud, but that he must also answer to a needling boss, which embarrasses him slightly. Over the course of the day, Kevin comes to understand that the trials his father endures everyday have nothing to do with being his father. He also learns that his father once wished to be a ship’s captain, navigating his vessel by watching the stars. This blows Kevin’s mind. 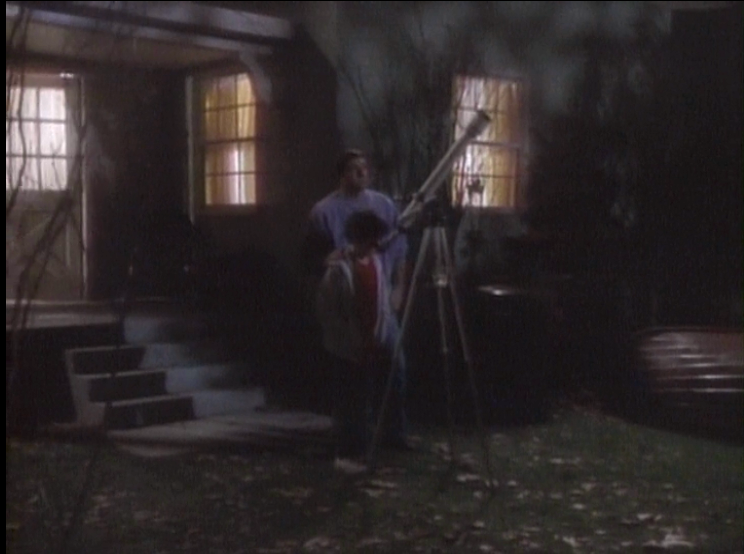 The episode concludes with Kevin joining his father in their yard to look at the stars. Up until this point, star-gazing had been something Kevin’s father did alone, when he was angry or frustrated. Kevin often watched him do this through the window with a mixture of curiosity and fear. But at the end of this episode, Kevin joins his father and they share this experience while strains of “Blackbird” play on the soundtrack. Of course, as Kevin points out, understanding comes with a price: “That night my father stood there, looking up at the sky the way he always did. But suddenly I realized I wasn’t afraid of him in quite the same way anymore. The funny thing is, I felt like I lost something.” I’ll admit that at age 12 I did not quite understand the meaning of Kevin’s epiphany (he always concluded the episode with an epiphany well beyond his young age). I, too, had a hard time seeing my father as a “real person” but I didn’t see why such an understanding would also be a loss. In fact, it has only been in the last few years, as I’ve watched my father’s body deteriorate and his attendant anger and humiliation, that I understood what Kevin Arnold meant. He meant that when we are able to see our parents as something other than a servant of our needs, our relationship with them changes. Once we realize that our parents have feelings and desires that have nothing to do with us, we understand them better. They become people, rather than parents. But we also lose a piece of our childhood once we gain that understanding. This is a loss that needs to be mourned. And sure enough, as the credits rolled on “My Father’s Office,” I cried. The Wonder Years is filled with such remembrances, structures of feelings I have long forgotten and which I doubt I could access in any other way. We all mourn in our own ways and in our own time. For now, I think, I’ll take my mourning in 30 minute journeys to my past, when my parents were both still my “parents” and when I had not yet become a parent myself. For some, nostalgia can be toxic and overwhelming but for me, right now, it is as comforting as a plate of madeleines, a cup of hot tea, and a seat on the couch in front of the glowing box. This entry was posted in Television, Uncategorized and tagged 1968, Dan Lauria, Fathers, Fred Savage, Mourning, Nostalgia, Proust, The cast of the wonder years reunites, The Wonder Years, Vietnam, Wonder Years DVD set. Lovely piece about a great show. I don’t have much to add, except that you’re making me want to start rewatching The Wonder Years right now. Thanks. The show really holds up after all these years. It doesn’t feel dated or of its time. Go for it! Loved this post! I was also the same age as Kevin and Wonder Years was MY show! Must watch it again soon. Thanks C. BTW, the letter I received in the mail that meant so much was from Randall. Of course. So sad to hear about your father. I know how it feels. And what a wonderful way to write about your loss – through the Wonder Years. Entwined through the loss of innocence, Kevin’s loss, your loss. Breathtaking. Loved me some Wonder Years as well! Really powerful piece of writing…thanks for sharing! This is such a beautiful reflection. It’s amazing how many varied things can help us process our grief. I’m sorry for your loss. Learning about death does not happen in school or even in books or movies. Or learning about the transition of our view of our parents as we age and as they age. I guess we’d never understand it without experiencing it. 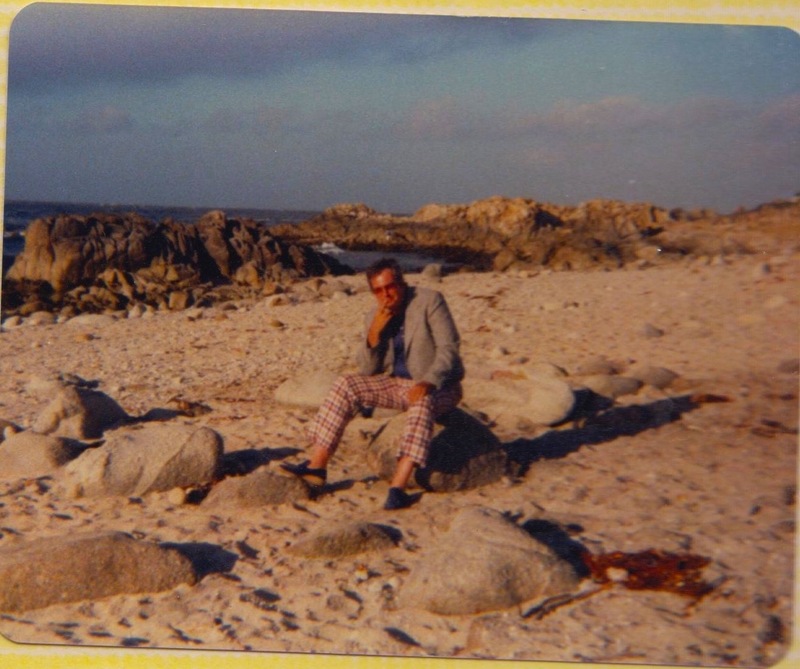 My father died over 20 years ago, after a long disability, and I sat on the side of my bed and mourned the father of my youth, not the old crippled man who had just died. It’s still so clear to me, being transported back in time. Thank you for this beautifully written post. HI ! found your blog after I was looking up stuff of wonder years. So you are from PA? You mention Susquehanna Township Middle School. I live in Shrewsbury and showed my son the Wonder years. He goes to middle school now. Hope you write and stay in contact.